Home bursa_master HOHUP HOHUP (5169) - A COUNTER NOT TO BE FORGOTTEN - INTEREST RE-EMERGING !! HOHUP (5169) - A COUNTER NOT TO BE FORGOTTEN - INTEREST RE-EMERGING !! This week, BSKL has seen rising interest in the CONSTRUCTION sector as talk of ECRL project revival is nearing to completion; which should continue into next week. Recently I had spotted this small cap company; an investment grade, which have been underlooked and undercovered - HOHUP CONSTRUCTION COMPANY BHD or HOHUP (Code 5169). I noticed considerable interest starts to trickle in on Friday where the volume registered a sizeable increase to 4.5 million. A bullish bias may appear above the MYR0.445 level, with an exit set below the MYR0.405 threshold. Towards the upside, the near-term resistance is at MYR0.505. This is followed by the MYR0.54 level. This positive momentum should carry forward next week ( forbearing instances of the adversity/ negativity of the regional markets sentiment affecting Bursa Malaysia) since it was able to close Friday conclusively above its major resistance of 0.445.I forsee it trending to the next resistances of 0.505 & 0.55 before heading to my personal TP between 0.73 to .80 on comfortable P.E. of 10 to 11 in the intermediate term. I think this is the biggest factor causing this stock not to reflect its true value. For the past 1-2 years, there have been lack of analyst reports and media coverage on this stock. With this article being posted, I hope that some of the IB / Research Houses and media members can serve public the justice by analyzing and publishing coverage on HOHUP. Let us refer to below image of the latest 3 years quarter reports of HOHUP. 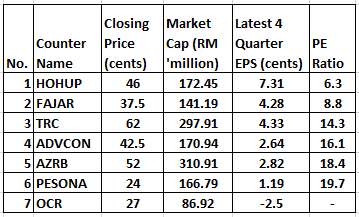 Recently, HOHUP had posted its historic highest revenue or RM 101 million in Feb 2018 report. Also, earnings in latest quarter are better compared to previous quarter. Totalling up the EPS per quarter, we get a total full year EPS of 7.31 cents. Below table of comparison between HOHUP and few peers in the Main Board - Construction. As you can see, HOHUP is currently trading at only a PE Ratio of 6.3, which is significantly lower compared to its few other peers out there. With a conversative PE Ratio of around 10-11, I would opine that this stock should be trading around 73-80 cents in near term. Let us refer to the monthly chart belowof HOHUP; captured from January 2013 to March 2019. We can see that HOHUP was trading significantly higher in the past and the current price presents big upside opportunity (up to 80 cents for first major resistane), compared to downside. 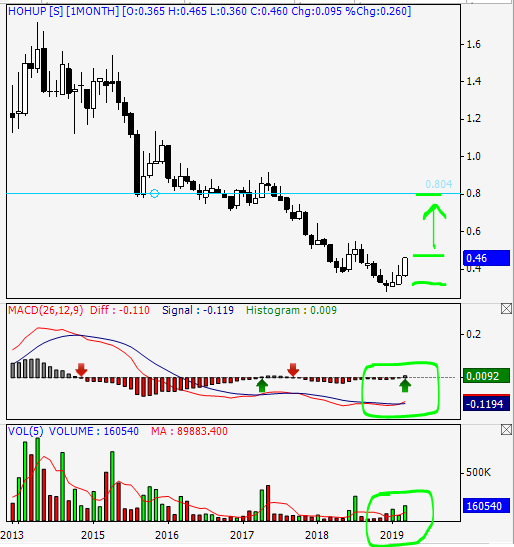 Technically, the stock is seen in bullish momentum as the MACD has crossed upwards with positive buildup in volume. 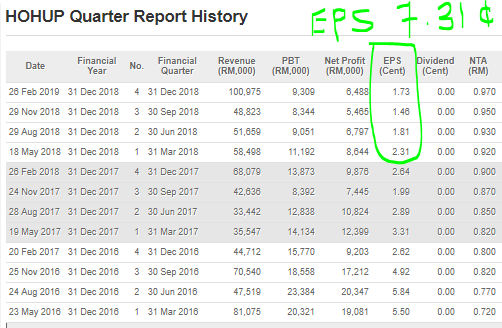 As the financials get better for HOHUP, for example EPS gets to 15-20 cents, I do not see any reason why it cannot go to above RM 1 in the longer term. Considering all the above, my personal TP for HOHUP is set between RM 0.73 - 0.80. I WILL PLACE HOHUP INTO MY INVESTMENT PORTFOLIO BEFORE FUNDS START BUYING INTO IT.